Seán Murphy, General Manager, commented, “We are introducing this service to make it easier for patients to remember their appointments and attend their outpatient appointments. On average 108 people do not turn up to their appointments every week which is a waste in resources and a lost opportunity to offer the appointment to someone else on the waiting list. “The text reminders will be sent 2 weeks ahead of the appointment and a second reminder will be sent 2 days ahead of the appointment. Patients are then prompted to contact the hospital if they are unable to attend and we can then reschedule their appointments and offer the slot to another patient. Letterkenny University Hospital is rolling out text reminders for patients with outpatient appointments this week. 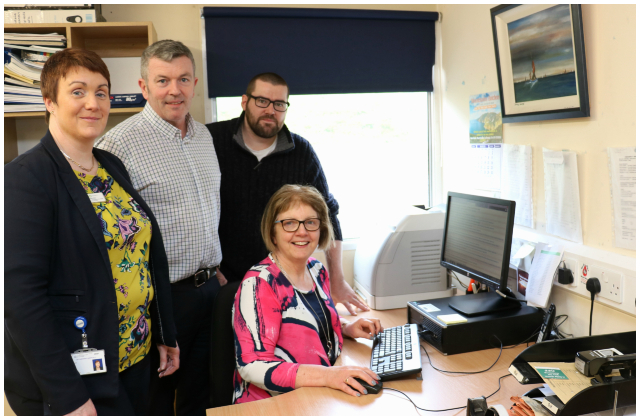 From left: Siobhan Kelly, Assistant Director of Nursing who lead the project; Anthony Campbell, Clinical Analyst, IT Systems Dept; Michael Logue, Clerical Officer, IT Systems Dept; and Colleen Reynolds, Patient Services Manager.